Music was a way of life when Mary was growing up in East Clare. Born in the townland of Clondanagh between Tulla and Feakle, she was from an early age in the company of the great masters of Irish Traditional Music of the region such as John Naughton, Martin Rochford, P. Joe Hayes, Francie Donnellan, Joe Bane and Bill Malley. And there was plenty of musical guidance and inheritance from her parents who were both from musical families. Mary learned much from her mother Ita whose discernment in music was unquestionable, with a musical pedigree reaching back many generations. Mary’s musical style was further honed and perfected as a young girl sitting by the fireside in the homes of Mikey Donoghue in Ballinahinch and P. Joe Hayes of Maghera and then Sunday afternoon sessions with Joe Bane and Bill Malley in Lena's Bar in Feakle. This unique musical nurturing has resulted in Mary being a highly respected musician performing at home and abroad and also one of the most sought after teachers of Irish Music today. Mary McNamara playing a set of jigs, with John Coyne accompaning on the bazouki, at her CD ''Note for Note' release party at the Burren Backroom. The CD 'Note for Note' and her other CD's are available from Mary here. 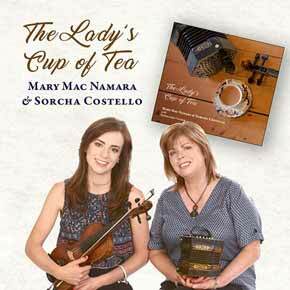 A new album from Mary Mac Namara and Sorcha Costello is now available. Click Here to purchase. East Clare Young Musicians are a group of young people who are mostly being taught music by Mary MacNamara. Read about their activities on the dedicated page on this website.